An essential part of business success is building lasting relationships. Keeping these relationships strong takes time and requires the right insights about your contacts. 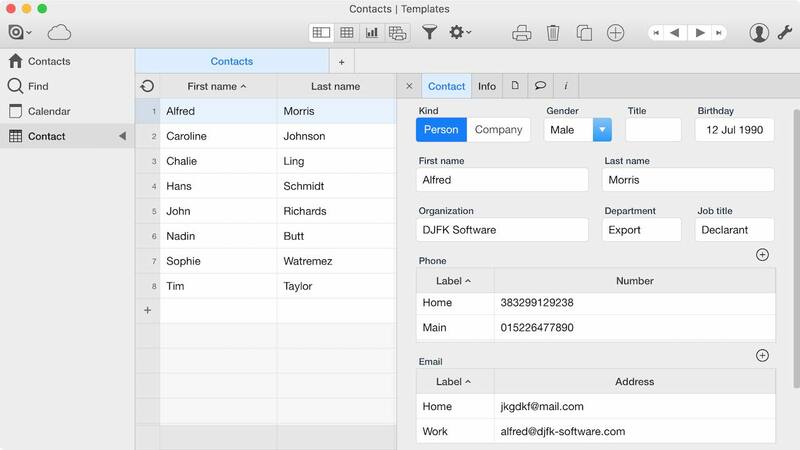 Use this template to collect information and manage your contacts in your own online app. Add categories for the type of business or personal contact (supplier, customer, employee, partners), industry, company and even add a personal touch on their birthday by sending them a custom email directly from the database or make a call from Ninox. This template includes a complete address history. Multiple phone numbers, emails, postal addresses can be added for each contact to help to sort your contacts in the cloud. You can even import your contacts from Mac and iOS address book. Take this template to the next level and build your own CRM tool - customized to your needs.